Sorry, very creative but the bottom line is the outcome and for me it´s not very aesthetically pleasing, image is way too busy for my taste and my eye isn´t drawn to any part of this photo. 5 from me. Looking forward to see how you did this. Great shot. 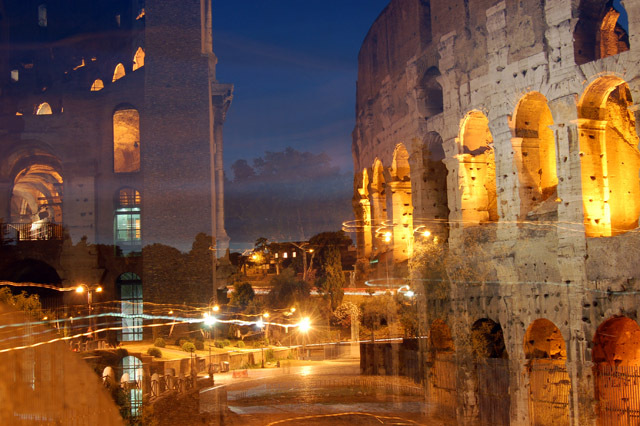 could the colosseum have been straightened by rotation? I find this shot confusing. It seems to be at least a double, maybe even a triple exposure. That and with the movement of the camera to create the light trails, there is nothing for my eye to settle on. I think you are on to an interesting idea, but the composition does not work well for this process. Your focus is good, and your exposure is as well, but the pic is kinda busy, and might have worked better with just one colosseum. This is a really cool concept. Too bad the bright lights made it hard to pull off. Not understanding what you were aiming for here, but its too busy, and cluttered. If this is a single exposure, I can't wait to see your notes about it. Proudly hosted by Sargasso Networks. Current Server Time: 04/20/2019 10:11:01 PM EDT.